The world of Corthis sits at the center of existence. The sun, moon, stars, and planets all orbit around the world. Natural philosophy, which includes geography, geology, and meteorology, has long held that Corthis is spherical. Geoffrey Hawkins confirmed this theory when he circumnavigated the globe in 1442. The sun's daily path around the middle of the world has scorched the earth with its heat and created a torrid zone at the equator. The poles of the world are far from the sun's heat and form arctic zones where everything is perpetually bound ice. Between the torrid and arctic zones are the temperate zones, which are capable of supporting life. 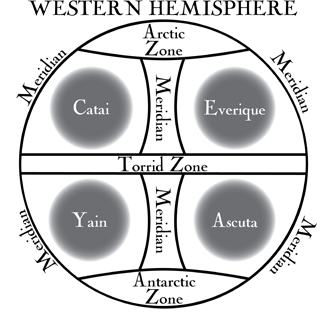 While the torrid zone separates the northern temperate zone from the southern, the four meridian oceans run from pole to pole and divide each of the temperate zones into four smaller regions. Philosophers from Japethe have long suspected that each of these regions holds a continent to maintain the metaphysical balance of the world, making for a total of eight continents on Corthis. The Arctic Zone encompasses the region around the northern pole of Corthis. It is defined as the region of the midnight sun, where the sun does not set for at least one single day each summer. The constant daylight is mirrored by the polar night when the sun does not rise for a day around the winter solstice. The region is bounded to the south by the Northern Temperate Zone. The Arctic Zone is a region of near-perpetual cold and ice that stretches from horizon to horizon. The parts of the region that have been explored seem to be ice-covered sea with a few islands rising above the frigid waters. The largest of these islands is Thule, which is inhabitable only because of volcanic activity. The Arctic Zone is beyond the tree line. What plants exist are stunted shrubs, lichens, and mosses. The most notorious residents of the Arctic Zone are the ice bears. These huge bears prey upon fish and the plentiful seals, but will attack anything edible that crosses their path, including crunchy human explorers. The storytellers of Japethe tell legends of giants living in this region, who are so pale of skin that they blend into the snow. They lair in great castles carved from ice and have trained the bears for war. Meanwhile, the natives of Everique believe that the arctic is the home of the spirit of the North Wind and Father Winter, who is the manifestation of that season. 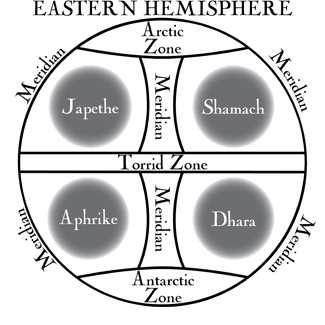 Philosophers believe that at the heart of the Arctic Zone is the northern pole of the world, a place where the sun only rises and sets once each year. At this point, the year collapses into a day, and time becomes stretched, losing its grip on the physical world. Some philosophers theorize that living at the pole could cause a person to age only one day for each year, creating a type of immortality for those that can survive the weather and are willing to never venture from that spot. The Torrid Zone (sometimes called the Tropics) encircles the world of Corthis at its equator. This region is defined as the region of the globe in which the sun passes directly overhead at some point of the year. The Torrid Zone is bounded on the north by the Tropic of Cancer and in the south by the Tropic of Capricorn. For the longest time, philosophers believed that the Torrid Zone was all but uninhabitable. The nearness of the sun to Corthis at the equator causes inhospitable deserts, dense jungles, and trackless swamps. Insects and animals are aggressive, disease is rampant, and the fierce sun burns the skin of the inhabitants until they are black as ash. This intimidating region is the subject of many Japethan legends, including that giants with nails of iron and hair of flame live at the heart of the Torrid Zone. In recent years of the Age of Discovery, philosophers have begun to question long-held assumptions about the Torrid Zone. While the region is challenging, it is not as dire as the early philosophers warned. Many great civilizations have arisen in the Tropics and have thrived, despite the insects, predators, and heat, and explorers have yet to find any giants.